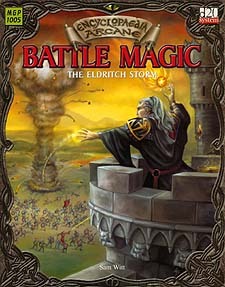 In this book, you will find no information on how to craft intricate illusions or research spells that help your follow adventurers see in the dark or span a yawning chasm - you will discover new spells devoted solely to destruction, new feats that boost your character's ability to wreak havoc on enemy forces, and prestige classes to add new fear and respect for spellcasters in your games. This book is for players and Games Masters who believe the highest purpose of magic is to rain death and destruction down upon their enemies. To Gird for Battle: Meet the greatest threats ever to stalk the battlefields of fantasy. The Battle mage studies spells of massive destruction, pulsing waves of fire that set entire battalions screaming and running like schoolgirls. When you are ready for a little guerilla warfare, just sign up the Elritch Warrior - a magical close combat specialist.